Then I realized what was wrong! 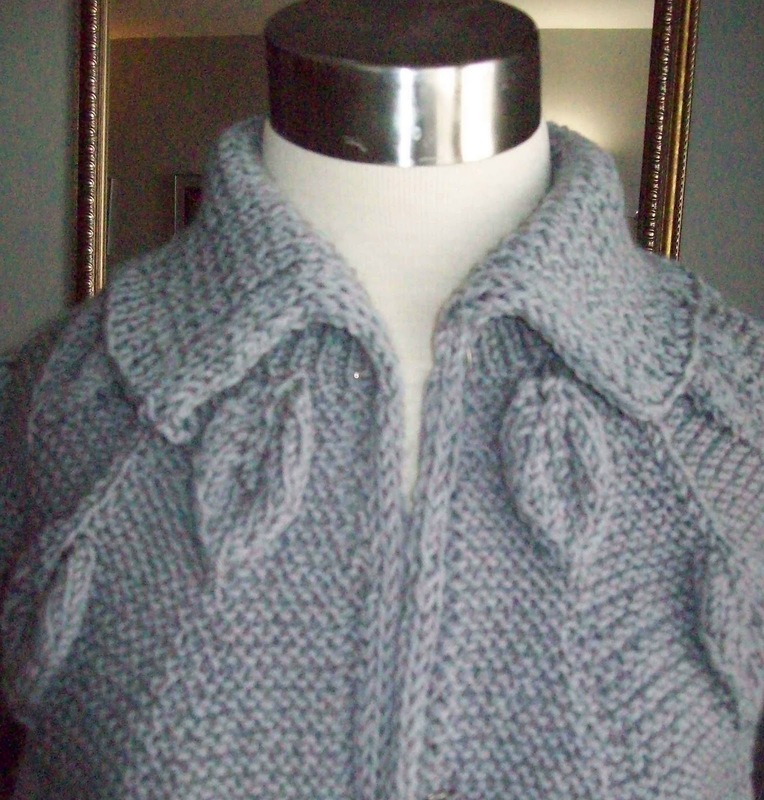 I started with a curved edge from the short row shaping in the back neck—and a straight collar was never going to fold to cover a curved edge! So a few short rows latter, a perfect fold, and collar just past 6 inches long. 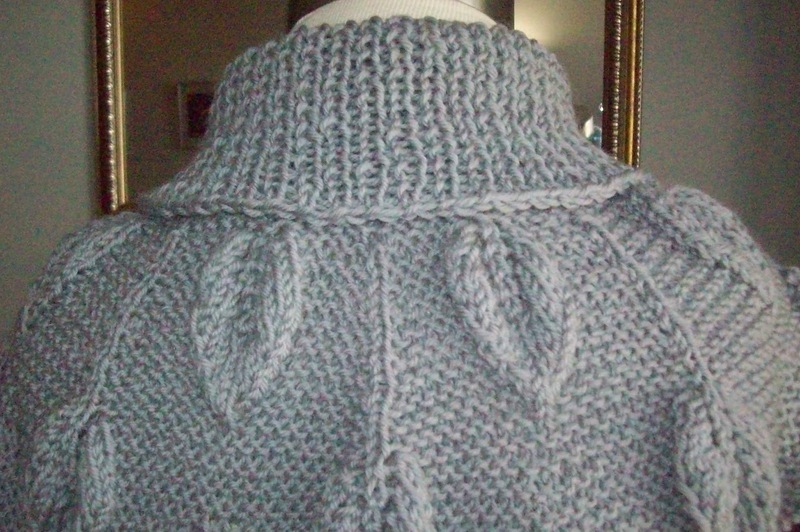 It was late, I was tired, and I just bound off the edge--I wanted the collar to be done! I had no sooner cut the yarn when I realized, the edge would look nicer if I had grafted the 1x 1 ribbing, instead of doing a standard bind off (in ribbing). You might notice, too the change--the last inch of the ribbing I went back to the size 8 needles.. I wanted the edge to be more stretched out and looser ribbing. That helped too, with the fold and fit. Well I am not going to frog and and redo—This week is going to be another mild one weather wise—but February is almost here.. and I'll need some warm layers to wear and I want to finish this up. I still am thinking about the sleeves. Do I just finish them off as cap sleeves? Or add a bit and make short sleeves. I think the latter. Saturday, after picking up my car, I was unsuccessful in my hunt for matching hooks and eyes—and didn't even have the option of another style—the selection of hooks and eyes was slim to non-existent. But the good news? Another pound shed! I weight myself daily (I know, I know, obsessive!) and I don't count a pound gone till its gone for 3 days running.. (there is another half pound in the running.. It's on day 2!) So the count is 25 pounds (since October) about 6 pounds a month—or about a pound/pound and half a week. Faster at the beginning, slower now and I am sure slower still in the coming weeks, but slow is OK. So long as I continue to make progress in the right direction! It's sometimes annoying that more people haven't noticed the change--(I have lost a lot of weight!) but realize its a childish need for praise—and I am working to get over it. I suppose, bundled up in sweaters and jackets, it's hard to see that there is less of me. Won't they be surprised when the spring time comes--and even more surprised in the summer.